Anti Academies Alliance Briefings. Please feel free to download and distribute, or share the links. The Tories’ free schools policy has already failed to deliver improvements. Academics, teachers and their unions, are scathing of the programme even if some individual free schools have done well or opened in areas of need. And it’s common knowledge that some free schools have failed spectacularly. In 2010 the newly elected coalition government rushed through a law to allow the Secretary of State to force schools to become academies. In 2011 Michael Gove announced that there were 200 ‘underperforming’ primary schools in England which he would convert. Early in 2013 he raised the bar, so hundreds more could be deemed as ‘underperforming’ and eligible for forced conversion. Just the threat of forced conversion is being used by Department for Education (DfE) brokers to coerce many more schools into converting ‘voluntarily’. So what is wrong with forced academies? 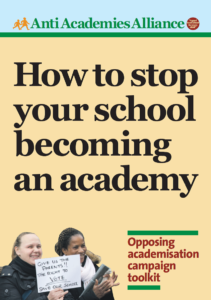 Secondary education in England is now a patch work of stand-alone academies, academy chains and free schools overlaying the already complex faith, voluntary and community school system. Gove’s free school flagships are springing leaks at an alarming rate. Despite mounting criticism about the expense of the programme, a new free school costing £45m was revealed. 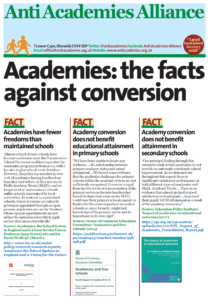 Despite the controversy, head teachers and governors, including those in primary schools, are considering conversion to academy status. This briefing looks at some of the main questions asked about why they are seeking to convert. The Academies Enterprise Trust (AET) is the fastest growing Academy chain. They currently run 19 academies. The government has identified 19 primary schools that it says are ‘underperforming’ and are to be handed over to AET. This will make them the largest chain in the country with 38 academies. 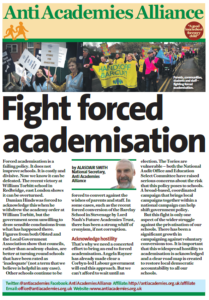 The Harris Federation is a key player amongst academy chains and has played a leading role in developing academy policies since they were introduced by New Labour. Harris Federation have several well established schools. a lot of good feedbacks.